At the height of 5.9 with shoe size of 7 ½, my feet take a pretty good beating and I am always looking for products to ease the pain from being on my feet. I am often standing all day or wearing uncomfortable heels. 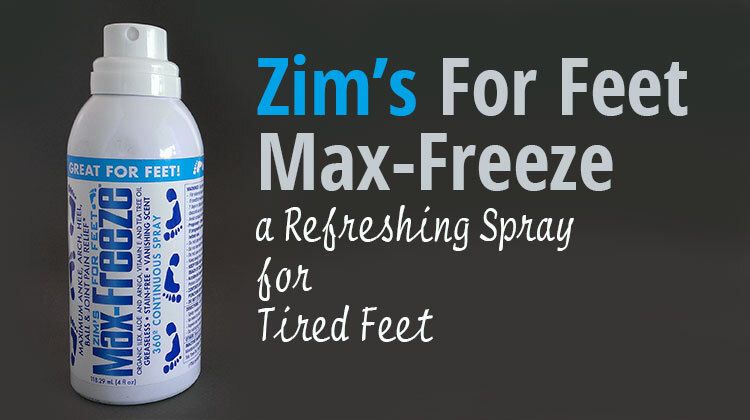 Zim’s recently sent a complimentary bottle of their Feet Max-Freeze for us to review. It worked nicely to refresh my tired feet with a light cool feeling. It isn’t too strong, it’s greaseless, won’t stain your clothing or beading and doesn’t have a strong scent. It sprays on smoothly and no rubbing is needed. The ingredients includes organic ilex, aloe, and arnica, vitamin E and tea tree oil. I personally like using Zim’s For Feet Max-Freeze on my feet before falling asleep. I also enjoy sometimes using it for temporary muscle aches and joint pain such as my back, knees and wrists. I would recommend Feet Max-Freeze for those who want a light relief for tired feet. This product is ideal for those who don’t like a strong cooling feeling and or bad scents like some competing products have.